Good-2-Go Chiropractic is a traditional chiropractic website with a modern twist. The goal of this site is to provide user-friendly information to individuals who are looking for a chiropractor in the Palm Harbor, Florida area. More specifically, the site is designed to help people suffering from certain types of injuries know that they have come to the right place for help. Car accident injuries, sports injuries, and neck and back pain are just some of the conditions highlighted on the site, along with the types of treatments that can help patients find relief. On this site, the chiropractor’s expertise shines, with extensive patient education available for the various conditions treated by the practice. The site also includes detail and answers to common questions about manual therapy, chiropractic, and other services offered at the clinic, such as acupuncture. For the convenience of patients, we included a patient area that provides access to new patient forms that can help expedite waiting time at the first visit. The ‘about’ section gives insight into the background of Dr. Goodman and the practice, and the ‘contact’ page provides information about the ways site visitors can schedule an appointment or get in contact with the staff. Blue is the color of choice for this website, as it exudes calm and relaxation. Blue is also a color that provides a sense of wellness and new beginnings – two things that most patients who visit this practice are looking for. We offset the various shades of blue with gold accents and a white background, which compliment the primary color and also create a more open space. 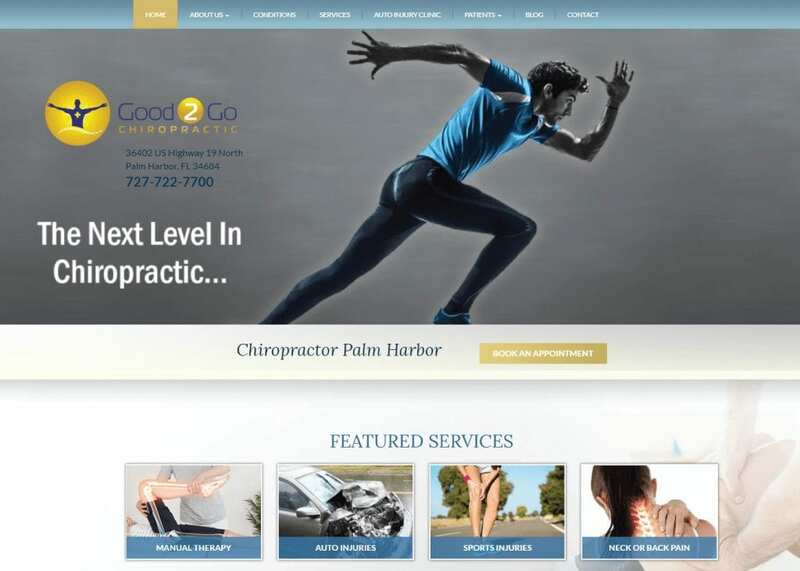 The Good-2-Go chiropractic website features a few unique design elements that give the site a custom feel. It is highly responsive and sensitive to the actions of the viewer. As visitors scroll through the page, the chiropractor’s image appears next to a short introduction to the practice. In addition, the home page links to featured services at the clinic in the form of images that interact with the viewer when selected. We also included scrolling imagery atop the home page that allows this practice to better identify with a wide range of patients of all ages and health backgrounds. To round it off, we also included Good-2-Go’s blog on the navigation menu for optimal engagement as well. This practice enjoys being connected with its patients and the local community. That is why we included multiple links to their social media accounts, where Dr. Goodman and the team provide ongoing updates, information, and wellness tips. We also implemented multiple opportunities throughout the website to schedule an appointment, as well as search engine-friendly content designed to generate a continuous stream of organic traffic to the site. Designing a custom website for a chiropractor is all about knowing the audience. Chiropractic patients – especially first-time patients – are often coping with pain from an injury or chronic condition. That is why the images on this site are designed to identify with the types of injuries most chiropractic patients experience, regardless of age. There are pictures of car accidents and sports activities, which are common causes of injuries. There is also a large silhouette of the human form that is labeled with the locations of many different types of injuries, including the elbows, shoulders, back, hips, knees, and feet.